FlossieBlossoms: 2nd Place Winner in Giveaway! I'm a complete idiot, I had totally forgotten that I had decided to give one of these littler caddies away as a 2nd place prize. I must have thought it up during the night and then forgotten all about it, because all week I was pushing myself to make you a little 2nd place something and I HAD these all along! The photo is just a sample one, there are 4 languishing in the shop and the 2nd place winner can choose whichever one she wants. 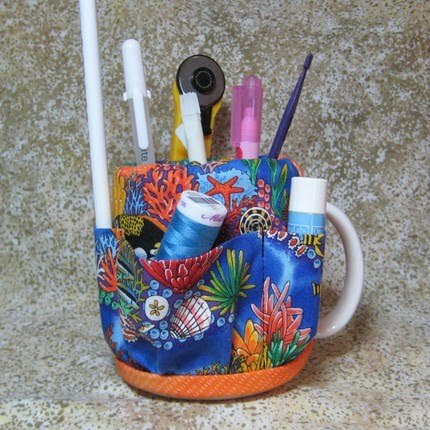 I gotta tell you, I have one of these next to my sewing machine, in a big chunky goblet and I just love it, I use it all the time and it saves me a lot of time and scrounging up of bits because they're all organized in my wild colored one. NUMBER 22- LynneS of Oz! I am sure we also know her as Natiel3, right??? You are very generous and what a nice prize! Me? *jumps up and down and squeals and claps hands with glee* Me? Thanks, Sooz! Oh decisions, decisions - they are so pretty! And given the way things just walk around here, useful too. Can I have this one, http://www.etsy.com/view_listing.php?listing_id=22333100 turquoise parrots with pink please? Thanks, Karen. You're sweet to say so. I hope you enjoy it and be sure to try it in a goblet, I really like mine like that, up higher. Fits perfectly, too! You are so nice Susan; I think I might have to do some shopping at your Esty store!! Of course I only know ONE person who would truly love and treasure a gift from you. I'm just sayin', I don't know too many quilters. ~LOL~ Lucky ME huh?